This is not a claim made lightly. But there are too many signs in Ashes of Ariandel to deny that Dark Souls may be a prequel to Bloodborne. FromSoftware is meticulous about lore details to a degree bordering on absurd; the connections between the games have been there all along, but the Dark Souls 3 DLC, Ashes of Ariandel, brings them into the light. 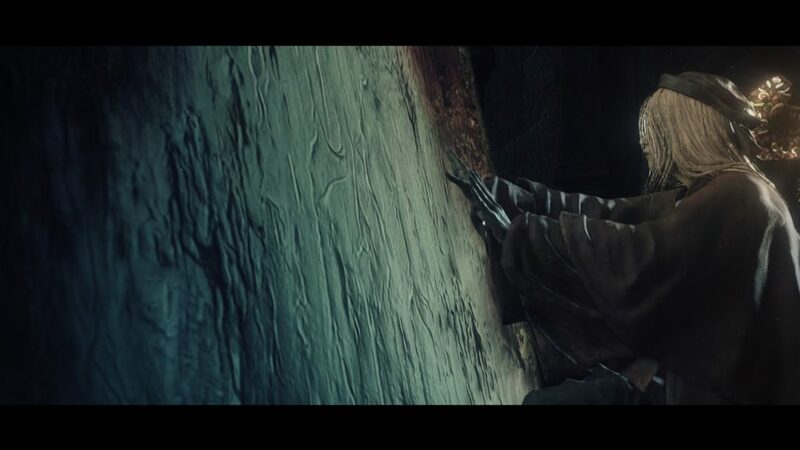 Dark Souls 3 links its lore to Bloodborne’s with a very simple thing: Blood. SPOILERS: End-game plot details for Bloodborne and the entire Dark Souls series ahead. The connection in Ashes of Ariandel comes down to an equivalence statement. A girl known only as The Painter remarks in front of a red-stained canvas that she will soon be brought “the pigment [for the painting] … The dark soul of man.” The name sake for the series, The Dark Soul was a tangible thing, split amongst all humans in the form of tangible Humanity, and drives most of the series’ lore. But we know something else about this “pigment.” The Painted World of Ariandel, which exists within a painting in the “real world”, was actually restored by Ariandel, and originally painted by some Ariamis, using blood. As the Rose of Ariandel explicitly states, “the Painted World …was painted with blood.” The Painter intends to make a new Painted World… with the Dark Soul. This equates the Dark Soul to blood, and the implications are extraordinary. Blood, as it turns out, has always been a big part of Dark Souls 3, through an unlikely source: Insects. DS3’s waterways contain Sewer Centipedes, and the DLC confirms they come from the Painted World’s rot– which is rotting blood. 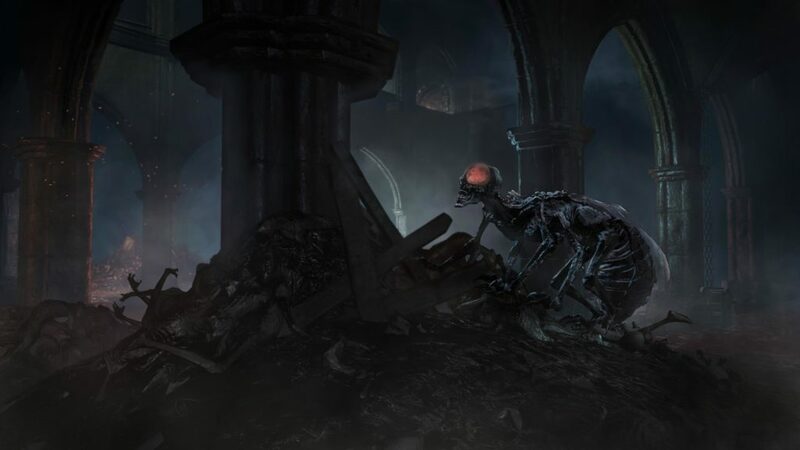 In Bloodborne, Vermin are centipede-like creatures discovered in blood, “and are the root of man’s impurity.” They’re likely the source of power for the Vilebloods and human/mosqituo Bloodlickers. Insects come from blood, but also “the Deep”. The miracle Gnaw summons “insects which lurk in the deep.” The Deep is new to Dark Souls lore, but is closely associated with humanity. Deep Protection tells us that the deep “became the final rest for many abhorrent things.” The Deep Gem states that there is “a darkness beyond ken,” or what is known. The range of ken recalls Bloodborne’s kin of the cosmos, and the fact that insects come from blood and the Deep– which is linked to Humanity, shattered Dark Soul– is another point of equivalence. The Deep dyes souls dark blue. Deep Souls “swell from the deep [and] pursue their target, drawn towards life.” The Great Deep Soul explains that to sorcerer-priest Archdeacon McDonnell, “stagnating souls… represented the glorious bedrock of this world.” These are called Human Dregs, “the heaviest things within the human body, [which] sink to the lowest depths imaginable.” They look like Humanity from prior Dark Souls games. And dregs have a FromSoft precedent: Blood Dregs from Bloodborne, which, incidentally, look like the Souls of the Deacons of the Deep. Dregs of Humanity, like dregs of blood; a third equivalence. And Humanity, like the Deep and insects, infects. In Dark Souls, Humanity is physical, and has its own drive separate from its host. The Dark takes physical form in the Abyss, a constantly spreading darkness. DS2 established mankind’s driving force is Want, and it’s likely that Dark is a manifestation of Want. As the Abyss-based Black Serpent pyromancy describes, “all techniques that infringe on humanity lead to the same place… they all seek a will of their own.” The Dark Hand, too, “mercilessly saps the essence of its victims”, hungry. Dark spills from and controls DS3 enemies, the Pus of Man. Ashes of Ariandel introduces a new form of this Dark: Blackflame. The Painted World’s guardian, Friede, takes on the title “Blackflame” and rips a Dark-based fire from, importantly, herself. The gods were supposed to let the first flame die, letting the Age of Fire fall to the Age of Man, but they instead linked Humanity, and thus humankind’s existence, to the flame. The existence of Blackflame, coupled with DS3’s optional ending of absorbing the gods’ flame into your body, suggests humans will finally become independent. This would also explain why the base fear of Bloodborne’s beasts, which come from humanity’s animal side going wild, is fire. With all this in mind, there’s another relevant fire: The profane flame. Profane is the opposite of sacred; it is the entirely secular. The intelligence-based pyromancy Profane Flame states that “[Profane] fire… is said to have incinerated naught but human flesh.” Blacksmith Andre’s reaction to the Profaned Coal (which manipulates Dark and Blood): “I see the abyss in it…” So from the Abyss is born this not unholy, but devoid of holiness flame, that cannot go out (entirely new in the Souls cannon) and seeks humanity. This brings us to Pontiff Sulyvahn. Sulyvahn’s Profaned Greatsword states that when he found “an unfading flame… a burning ambition took root within him.” Irithyll was a city of the gods, but Sulyvahn was a large part of it becoming a grotesque church to a monstrous man, Aldrich. As Sulyvahn’s Greatsword of Judgment states, “Its dark blue hues, deeper than the darkest moon, reflect sorcerer Sulyvahn’s true nature.” Sulyvahn is a link between the Deep and the profane flame. This pursuit of knowledge leads to another Bloodborne mainstay: Madness. The Deep Ring explains, “in the Cathedral [of the Deep] slumber things most terrible, and as such, the deacons require a… philosophy, to ward away the madness beckoned by the grotesqueries at hand.” Late in DS3, you have to defend yourself from literally evil books: With knowledge comes madness. Dorhy’s Gnawing tells a similar narrative: “Those who linger too long on the brink of the Deep will often slip.” This range of ken leads to madness in both games. Sulyvahn channels his power through eyes. In Bloodborne, eyes are a symbol of knowledge of what lies beyond man. Sulyvahn means “dark little eye” (FromSoft is meticulous about naming characters), and he distributes eye-rings which state, “Knights who peer into the black orb are… transformed into frenzied beasts.” Sulyvahn’s beasts look extremely similar to the Watchdog of the Old Lords from Bloodborne’s Chalice Dungeons, which lie deep beneath the earth at the root of humanity’s contact with the old-god Great Ones. Just as Bloodborne’s transformed beasts remember their previous life, if a Sulyvahn-beast survives a riposte, it lies on its back and prays. It makes sense that the cold Sulyvahn was the aide of DS3’s most evil– and important– Lord of Cinder: Aldrich. Aldrich’s Japanese name エルドリッチ is pronounced “Eldritch”, which means eerie and is used to describe the H.P. Lovecraft horror which inspired much of Bloodborne. His name’s likely derived from “ald”, meaning “old”, and “ric”, meaning “ruler”—“old king”, or “old god”. Aldrich recalls real-life Saint Aldric of Le Mans, who “showed a practical turn in building aqueducts and ransoming captives, as well as building new churches and restoring monasteries.” He created churches, dealt with captives, and built aqueducts—a man interested in water. This comes back up. What is this Age of the Deep Sea? It may be related to the Sulyvahn and the profane flame. Sulyvahn was born in the Painted World, and lives in frozen Irithyll. Flame is necessary to burn the Painted World, and the profane flame beneath seaside Irithyll is melting it. (The Sewer Centipedes live in marshes beneath Irithyll, implying melting.) 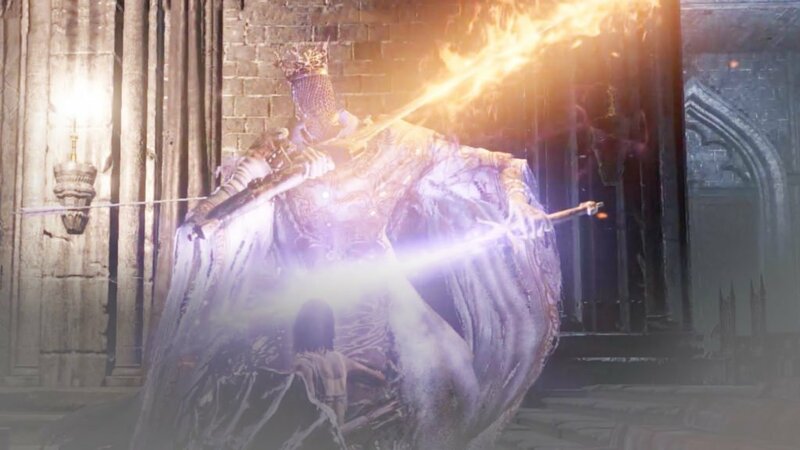 And Aldrich’s dreams are proven real; he learns Lifehunt Scythe by dreaming about “a young, pale girl in hiding.” The candles melting down Aldrich’s abandoned tomb look like the “Deep Sea” runes from Bloodborne. The sea is an important symbol in Bloodborne, and home to a Great One. The young, pale girl ties Aldrich to Halfbreed Priscilla, and thus another important group connecting to Bloodborne, the halfbreeds. In other words, halfbloods. Several half-god, half-dragon halfbreeds exist in Dark Souls 3, all described as abominations, but most intriguing is Ocelotte, whose name means “little eyes” or “covered in eyes”. He can become invisible, like Priscilla, and is protected by his father Oceiros, who became part-dragon and bred with a goddess. Ocerios comes from Osiris, which means “she who bears the eye”. Oceiros “went mad trying to harness his royal blood for a greater purpose,” which lead to him studying Seath the Paledrake. Seath was obsessed with immortality, and then his bloodline, fathering Priscilla with a goddess. This is important because when Oceiros becomes enraged that Ocelotte won’t become visible or use his power, Oceiros smashes his invisible infant into the ground with a burst of blue magic. But Ocelotte cries the whole fight with Oceiros– even after Ocelotte is killed. This is possible through one of Bloodborne’s most important motifs: Dreams. In Dark Souls, Dragons are linked to dreams. In order to reach Archdragon Peak, the player must pray and fall asleep, awakening on the peak. The dark and ruined sky has become a beautiful day– with a massive moon out as well. (The sun is associated with gods; the moon, dragons.) Did the player teleport? Or are they dreaming, with their consciousness projected? Bloodborne’s “dream” world overlaps with its “real” world constantly, and those who die in one can live on in the other– and freely move back and forth between the realms. As Ocelotte’s dream-self seems to be doing. This recalls Bloodborne’s omnipresent infant crying, which can only be heard when you have high Insight, denoted by an eye. This crying voice is a Great One, likely Oedon, and like all Great Ones it’s obsessed with reproduction. In Bloodborne, one woman can bear Oedon’s child, in fact. Seathe, Oceiros, an immortal infant, and Oedon (who may be Ocelotte), are tied by one last thing: Blood. Dragons are weak to lightning because it breaks their scales, and lets them get diseases in their blood. Seath had no scales, and so had resistant blood, and researched immortality using intelligence-based sorcery. Oceiros, in turn, is resistant to magic and bleeding. 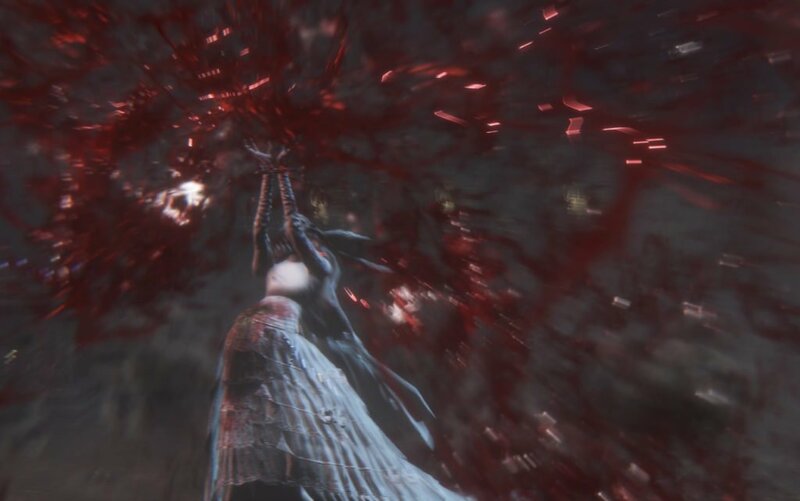 And the Vilebloods of Bloodborne got their “impure”, abominable powers from the blood of Queen Yharnam, who mated with a Great One— and gained the power to use her blood as a magical weapon, as well as Seath’s dream, immortality. Yharnam’s blood is also the source of Vermin. Which brings us to our conclusion. 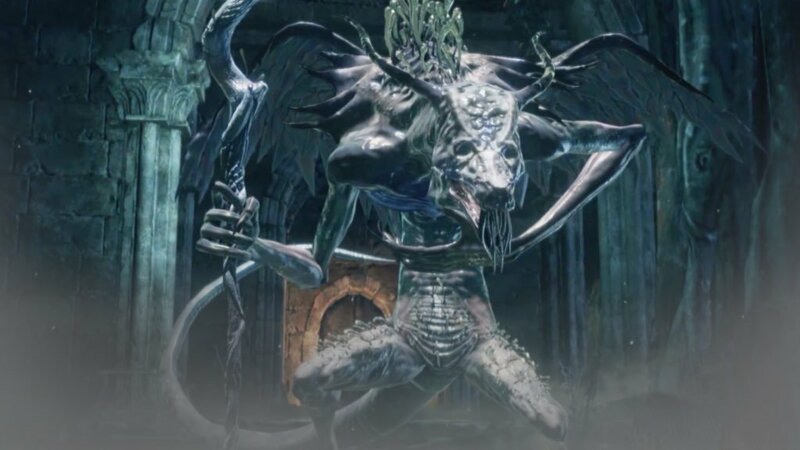 The events of Bloodborne may have been started by dragon/god-halfbreed Ocelotte mating with Yharnam, who had Dark Soul blood. Why is this lore-connection important? Dark Souls was about unstoppable, cyclical fate, but DS3’s flame-ursupring ending and Blackflame hint at the Age of Man finally coming. But the gods and dragons will not be gone, though they may be forgotten, becoming Great Ones. Dark Souls is about man’s desperate want for autonomy, and Bloodborne is about a godless, guide-less world where man destroys itself wanting to ascend to godhood, wanting to be more. In both canons, not wanting is giving up, and wanting drives one to ruin. The tragedy of Dark Souls and Bloodborne is that humanity is goal-oriented, not life-oriented. The lore aligns with the gameplay. Failure is common and achievement brief, but it’s the journey, not the ending, that makes it worthwhile. And this lore-link creates a fuller tragedy for Humanity. Wanting freedom, wanting power, and realizing neither will give their lives meaning. This investigation is not to be mistaken for proof. But if you follow the blood out from Ashes of Ariandel, you might find yourself in Bloodborne.